I had a dream last night that was so vivid, I just have to get it out of my system. It was so realistic that I half-expected a volcano drill to go off during work today (what would one do during a volcano drill? Duck and cover? Run? Turn off all your lights, lock your doors, and cower?). At any rate, in the dream, I am sitting on the cement walkway outside my classroom, talking to fellow coworkers. Suddenly, the volcano near the W portables starts to erupt (this makes perfect sense in the dream, cuz you know, our campus is equipped with all of your typical school-type facilities: one cafeteria, one gym, one library, some basketball courts, a volcano...). We walk toward the low rumbling sound, but at some point my coworkers disappear, and I am alone. I find myself standing on top of the volcano, staring down in horrified fascination (this part reminds me a lot of Kristyn's rock dream, so I'm obviously quite impressionable. She needs to slap a copyright on those suckers next time). Transfixed, I slip and fall (at least I didn't jump in). I now find myself balanced precariously on a cluster of black, sharp rocks at the bottom of the pit. A man stands on the rocks with me. I frantically look around, and I am surrounded not by lava, but by foaming, boiling water. The water is chaotic and tumultuous, hissing at my bare feet as it slowly rises (did I forget to mention that it's Barefoot Friday?). It has a current all of its own and churns madly around me, sloshing up the sides of the wall, exploding upon the jagged rocks, and spraying white hot mist up my calves. The man wraps his arms tightly around me. I think he's going to help us escape, so my body leans into him with relief. But I slowly realize that the opposite is true; he has no intention of saving me. He is pinning me in place. The water rises higher, and I can't move. But I don't really care. I already know the ending, and it doesn't matter that the mountain walls seem easy enough to climb; I know that it is our fate to be overcome by the water. The scalding water seems to take a life of its own as it sizzles around my ankles. I cling desperately to him...and then wake up. Sorry, I swear I'll try to quit writing down dreams. Hey, at least I didn't go into detail about the dream I had two weeks ago in which my small intestines were unraveling (poor Shannon had to hear about that one). Hopefully my next post will be more grounded in reality. Yikes, being boiled alive doesn't sound like much fun. 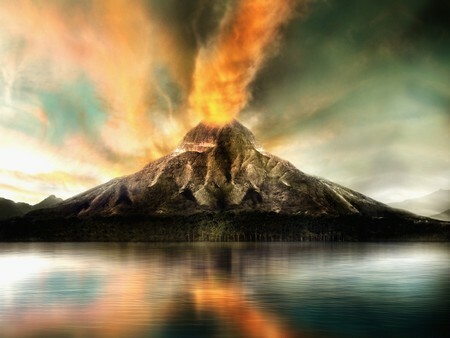 It's interesting that you dreamt about a volcano in a place that's familiar to you. For the record, I wouldn't work or go to school anywhere that had it's own volcano, even if that volcano spewed boiling, foaming water! Giggling at that last comment! Are you a peeping tom, Kristyn, sneaking unsolicitated peeks into peoples' subconscious-es? (haha). No worries, I actually enjoy hearing about other people's dreams too, so I get it. Gee Kristyn, reading are blogs isn't ENOUGH for you? Now you have to peer into our unconscious mind? Hehe!! !